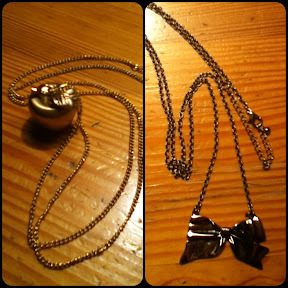 Both necklaces from H&M, both 6.95$ (Can). What's nice about both the apple and the bow necklace (aside from the price, and aside from they are so cute and versatile), is that they're a good length. They'll make great layering pieces. These necklaces are so beautiful. 6.95$ is not an expensive price for these elegant looking necklaces. Thanks for sharing the pictures.